1. The good news is, Maplewood is progressing. The bad news is, it is not progressing fast enough. A combination of bad weather (rain-outs), and staffing issues. The weather delays had been so bad (with rain 2.5x monthly normals in October) that some subcontractors walked away to take other jobs – while the ~200 Maplewood construction jobs are quality union labor, it’s been difficult to get a full week’s work in. It’s a Monday-Friday job; with a rain-out, they lose a day in the week. That means they also lose out on a day’s pay. Over the past year, 37 days have been partially or fully rained out. A provision in the subcontractors’ contracts allows them to leave for other jobs id the issue becomes too severe, so some have done just that. Not hard feelings, just a tough situation for everyone. Now about 25 days behind a very tight schedule, EdR and LeChase are asking to be allowed to regularly work 8 AM – 4 PM Saturdays. The town is open to this, but wants more documentation before signing off. So, expect a six-day workweek during the winter and spring. The goal is still to deliver the $80 million, 872-bed project by July. 2. The Seneca Street Garage is “showing its age”. As the garage is now about 45 years old and is designed to last about 50 years, some components are starting to deteriorate. The city has constructed some shoring posts to keep the concrete pillars relatively stable. They are not at risk of collapse, but the tension cables, which are used in combination with rebar to provide for a heavy-duty concrete structure with fewer columns, are starting to wear out. Decades of salt, water and corrosion will do that. The city will lose about 20 parking spaces from the life-extension measures. The Times is reporting that the city hopes to get another ten to fifteen years out of the garage, and hope to have a plan for replacement parking in place within ten years. That could be a demo and rebuild of the garage, or it could be something more substantial, like the Green Street Garage project. It’s something to mull over now, but there are no big decisions planned anytime soon. Perhaps a Seneca Street rebuild with mixed uses ends up being one of the big urban developments of the late 2020s. 3. A development site on West Hill has exchanged hands. As covered previously, Bella Vista was a planned 44-unit condominium project on Cliff Street that was approved in 2007, and never came to fruition. The site it was proposed for, an 11.71 acre property at 901-999 Cliff Street, was put up for sale in December 2015 for $395,000. Finally, it has been sold. The developer, Mauro Marinelli as Primary Developers Inc., sold the land to American Blue Sky Holdings LLC for $330,000 on the 5th. The LLC is owned by local businessman Greg Mezey, who previously bought the 12,000 SF medical office building next door at 821 Cliff Street for $945,000 in February 2015. Since then, he and realtor Ryan Mitchell have undertaken some modest building and site improvements. As Red Door Rentals, they own and manage a few apartment houses with a total of about 25 bedrooms. So what does that portend here? Good question. Watch and wait, for now. The Bella Vista project could still be built, but it must be re-approved by the city of Ithaca, since project approval is only good for two years. Zoning is R-3a, primarily residential uses with up to 4 floors and 35% lot coverage. Parkin is one space per unit or three bedrooms (whichever produces more), and small-scale commercial is allowed with a special permit. The site’s topography is a challenge, but the size of it and its proximity to downtown and the West End make it an interesting opportunity. 4. It looks like the first phase of Dryden’s Maple Ridge subdivision has just about filled out. For owner/developer Paul Simonet, it’s been a long time coming – the development launched right before the recession in 2008, and development didn’t really take off until the economy recovered. In 2013, there were three houses. By November 2014, only four houses had been built, with a duplex underway. Now, there are ten homes, and just about all one of the home lots have been sold. Some of the lots in phase one were combined by buyers. Interesting, many of the homes built in Maple Ridge are modulars – I half-jokingly suggest that Carina Construction take prospective buyers through here to show them the variety of options one can pursue with modulars. It looks like this latest build on Applewood Lane will also be a modular – the foundation is built (note the dark Bituthene membrane for moisture protection), and the pieces will be trucked over and craned and assembled shortly, if they haven’t been already. Ultimately, Maple Ridge is supposed to be three phases and 50 lots, and phase two will have about 29 lots, and since these are larger, they’re less likely to consolidated as phase one’s were. Given the need for a new road and infrastructure, sales seem unlikely until well into next year. The village minutes (the few they upload) does show that Simonet is actively pursuing the second phase. It also answers a question from last week – the Elm Street office/warehouse complex will be the new home of the Ithaca Ice company, after some modest renovations. 5. The Lakeview affordable housing plan for the 700 Block of West Court Street, now called “West End Heights” was selected to receive a $100,000 grant from the inter-municipal and Cornell affordable housing fund (CHDF), but the funds will be delayed a little bit because they need to be moved into the 2018 budget, as the check will be going out in 2018. 6. 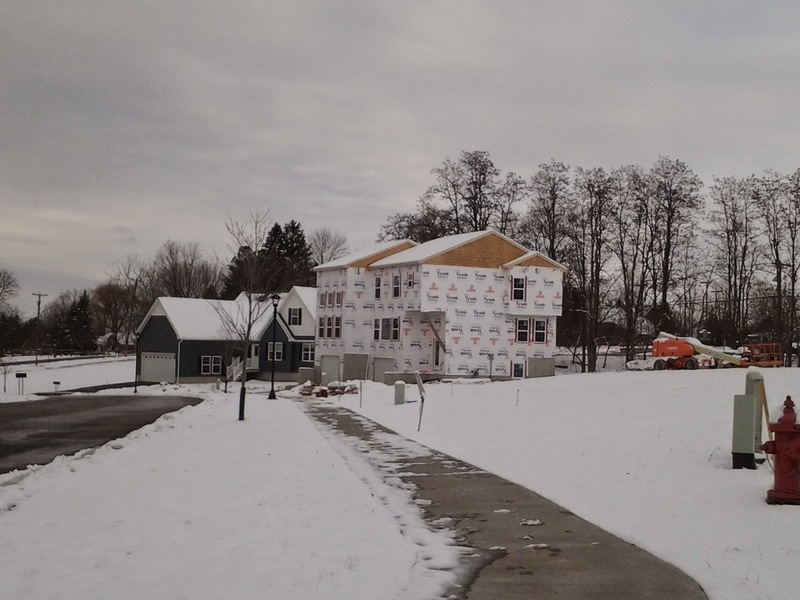 The latest phase of the Village Solars (the reconstruction of 102 and 116 Village Circle) is being built with a $6 million construction loan from Tompkins Trust Company. The agreement was uploaded to the county’s records on the 7th. The contractor is “Actual Contractors LLC” with an address at Stephen Lucente’s home on the lake – it’s their in-house construction crew. Albanese Plumbing will be rigging sprinklers, heating and water pipes, T.U. Electric will be doing electrical and fan installations, and Bomak Contractors of Pennsylvania is the subcontractor for excavation, bedding and foundation work. Apparently Larry Fabbroni, the consulting architect, charges $90/hour for design work, while engineering/surveying is $107.50/hour. 102 and 116 comprise 42 units (24 and 18 units respectively), but if you’ve been reading the construction updates for the project, then you already knew that. The loan says both buildings have to be completed by August 15th, 2018. 7. Not a whole lot going on at the moment. Lansing town will be hosting a Planning Board to look at a telecommunications tower, and three new 1-acre home lots to be carved from a larger lot off East Shore Circle. The city’s project review meeting is so slim, they didn’t need to attach any files – just the old business with the Sophia House addition on the Knoll, and that’s it. The city Board of Public Works will be looking at plans for a new inclusive playground at Stewart Park.